First time snow bird. Managers are great hosts. Grounds are kept clean. Park is conveniently located within easy reach of shopping, restaurants, beach and golf courses. Pets are welcome, but must be leashed. Cleaning up after pets is strictly enforced. Park is quiet BUT be prepared for typical city noise. Many people there are veteran RVers and welcome newbies. Clubhouse is spacious and pool is focal point on hot days. 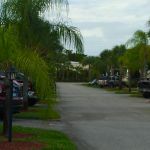 This is an ideal location for first time visitors to Naples or for those looking for a more urban RV park. We camped at Neapolitan Cove RV Resort in a Fifth Wheel. Stayed here during peak season the entire month of March and loved it. The park has easy in and out sites for larger rigs. Great location on Tamiami Trail road into downtown Naples and local shopping. Lots of friendly snowbirds at the park with several activities during the month. The hosts are really friendly and lots of fun so don't miss the special events. We definitely want to be back next year so hopefully a site will be available when we can book later this year. We camped at Neapolitan Cove RV Resort in a Fifth Wheel. We stayed here for the month of September. This is small but beautiful and extremely well maintained Resort. There is easy access for big rigs in the pull-throughs, and there is shopping, restaurants, well just everything is right at hand and easy to get to. The summer managers went out of their way to ensure our stay was pleasant. When we had problems with our rig the managers provided assistance to remedy the situation, they suggested sites to see and suggested best place restaurants where, we just can't thank both of them enough. This resort is a must if you are in the area. We plan to return in the future, perhaps extending our stay. We camped at Neapolitan Cove RV Resort in a Fifth Wheel. Great, Great Resort. Extremely friendly owners,who were very helpful with info of area. Well maintained resort with beautiful landscaped sites and concrete pads. All the facilities were very clean and well maintained. Would highly recommend this resort to anyone who is visiting the area of Naples, Sanibel and Marco Island. Would most definitely stay here again. We camped at Neapolitan Cove RV Resort in a Fifth Wheel. This is a beautiful campground. The management is ok. The owners can be very rude at times whenever you see them on the campground. You're being watched for every move you make. Everything is reported to the manager the wrong way.They do expect you to participate . If you don't you're not welcome. No shower and the pool is no bigger than a bathtub. The clubhouse is much too small.They want you to trust them but they don't trust you. This is the only park that we know that wants your money before you get there the following season. Unbelievable. If you don't belong to their clique you're not welcome. I won't be back in this park. We camped at Neapolitan Cove RV Resort in a Fifth Wheel. Clean and well groomed park. Friendly group of people. Pool is small. No showers. No gym. Laundry. Park managers are friendly, helpful, professional and the reason we will consider seasonal next year. Seasonal rate is fair for what is offered. We camped at Neapolitan Cove RV Resort in a Fifth Wheel.